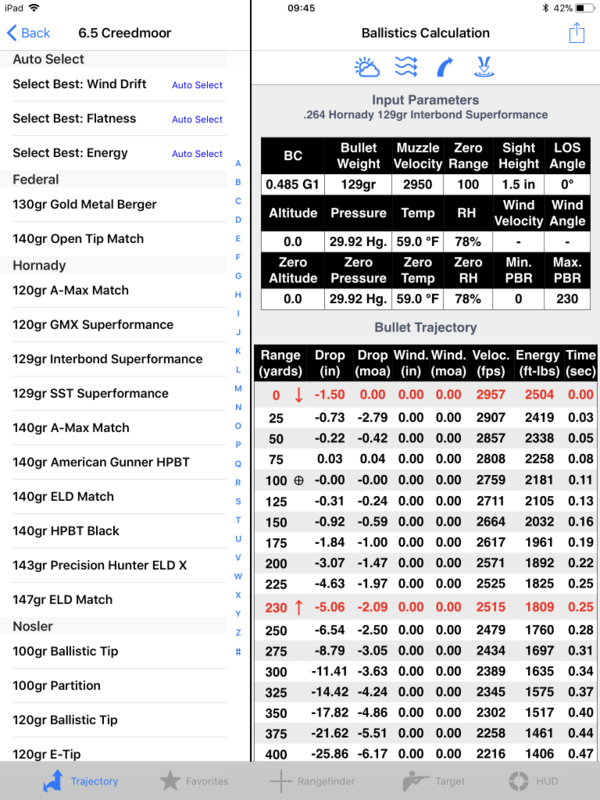 Any ballistic app can crank out calculations. Just plug in some numbers and the app will kick back its own set of calculations. Easy, right? But if you are a precision shooter who wants to make each and every shot count, you need to ask yourself: What exactly are those calculations based upon? At Ballistic, our numbers are drawn from a huge library of ballistic data. Huge. The Load Library incorporates data on over 5,000 projectiles, factory loads, and military loads, plus performance data points (like ballistic coefficients) from leading manufacturers, military testing, and performance testing. With Ballistic, for example, your exact projectile’s properties are drawn from the Library. The available datum includes the latest commercial data and several G7 military coefficients from Aberdeen Proving Grounds, as well as Bryan Litz custom G7 BCs and projectile-length data. The Ballistic Library is updated quarterly, and Ballistic staff is always searching for all that is new and improved in the world of long-range shooting, competition, and hunting. If a new factory round hits the market, for example, you can bet Ballistic will soon add it to the Load Library. Recent additions include factory-loaded offerings in .224 Valkyrie, 26 Nosler and 6.5 Creedmoor. If you are a reloader, Ballistic is definitely the place to go for ballistic information on the newest and the best bullets available. Recently, Ballistic added the Sierra TMK or Tipped Match King to the Load Library. Sierra’s newest addition to their Match King line of bullets, the TMK features an acetal resin tip to reduce drag. Maybe you are a fan of Hornady projectiles. The Ballistic Load Library recently added the Hornady ELD-M (Extremely Low Drag Match) bullet for competitive shooters, and the ELD-X (Extremely Low Drag-Expanding) an all-range hunting bullet. Both projectiles feature Hornady’s Heat Shield tips for aerodynamic efficiency. When your shooting is all about precision, that precision relies on having and using the most comprehensive data sets available. Make every shot count with the Ballistic Load Library.